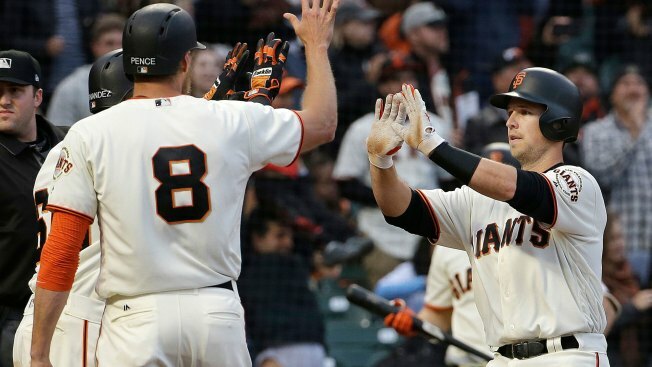 SAN FRANCISCO — The Giants completely swapped their lineup from Monday to Tuesday, going heavy on right-handed bats with a lefty on the mound. The Cubs, with so much depth, have the ability to do that whenever they want, and that’s allowed them to beat up on left-handed pitching all season long. The Cubs entered the second game of this series with an MLB-best 19-7 record against left-handed starters. Ty Blach didn’t care. He continued his second-half surge, cruising after an early three-run homer by Buster Posey. The Giants beat the Cubs 6-3. —- Blach, the man who wasn’t given a rotation spot out of spring training, out-pitched Jose Quintana, the man who brought back a blockbuster return last month. Blach was charged with two earned in his seven innings. The Giants hung four runs — three earned — on Quintana in his six innings. —- Blach has thrown at least seven innings in five consecutive starts for the second time this season. Only one other Giants starter (Johnny Cueto) has had a five-start run like that over the past two seasons. This was Blach's 11th start this season of at least seven innings, tying him with Jeff Samardzija for the team lead. —- It’s almost as if Jason Heyward took all the Carlos Moncrief’s Arm hype personally. He put on a show with four throws in the fourth inning, but the final one couldn’t keep Brandon Crawford from scoring. Crawford raced around third on Ty Blach’s single to right and slid headfirst, beating Heyward’s throw by an inch. —- Pablo Sandoval got a pinch-hit appearance in the seventh and lined the first pitch into center for a single. —- Miguel Gomez was removed with an undisclosed injury in the second inning. Gomez looked uncomfortable while running to first in the bottom of the first, and Joe Panik took his place on defense.